Good evening, my friends. Welcome to Week 4 of Big Brother…or should I say, Week 2 of King Jessie? When we left on Thursday, Jessie had won HOH in a (not-so) tense sudden death victory. Look for lots of self-congratulatory backslapping, scheming, and plenty of filler tonight. After the consistently-lengthier recap (although more entertaining than usual thanks to Ronnie’s crying outro), we go back to Laura’s eviction. Jordan is happy she wasn’t evicted, but is “sad” for Laura. Others have some comments, but the remark to remember comes from Casey, who says he hopes that this will be an easy week since the house should be united against one player. As Laura walks out, Ronnie starts pacing around the living room, and he says that although he knows he’s the target, he told his wife he’d “never give up so I owe it to her to fight with everything I have”. Russell adds that he’s pretty happy to have skated by the week, and should continue to do so since Ronnie is now the focus. “No one really cares about Russell, and that’s all I need right now”. We move on to Jessie’s HOH victory. He does his usual act in the diary room, and proclaims that he is still going to do what is “right for me”. Casey says in the diary room that he hopes “Ronnie is still the target, but you never know in this house”. Jeff pretty much repeats what Casey said. 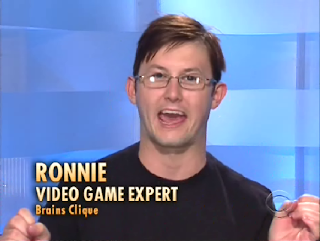 Ronnie is seen pacing outside, and a mic picks him up saying “thank you, God”. We move to the bathroom, and Russell asks Jessie if they’re still sticking to the plan. Jessie’s response is that he “has to do what’s best for me”. He adds in the diary room that he feels no obligation to put up Ronnie because he “never lied to me”. Russell then confides in the diary room about his secret alliance with Ronnie, and we see flashbacks of their secret meeting. 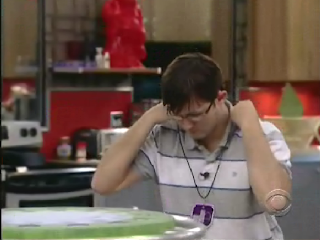 He doesn’t let on to Jessie and Natalie, though, and says that he’s “trying to play every single angle in this game”. Natalie pulls Russell into one of the bedrooms, and begins complaining how Casey has “almost” won two HOH’s. Um, yeah, but it’s your bff who has won twice. They both decide to try to get Jessie to nominate him, although Natalie seems to be a bit hurt that Jessie said “this time it’s my decision”. They decide to present it to him as that if he doesn’t go now, he’ll be gunning for them. Ronnie is now seen reading the Bible, and Natalie scares him by walking in. She invites him to come out and hang out with the crowd, and he says he’ll “be out in a minute”. She ends the conversation by saying that “you know you’re good this week”. While he still doesn’t feel “absolutely secure”, he is clearly revitalized by this statement. Filler time - we get to see Jessie’s second HOH room. Yeah, it’s the same as it always is. “Jessie lovvvvvvvvves himself”, Jordan says. “I guess it impresses some girls. Not me.” Casey laughs at the childhood pic, and Jessie’s “cowlick”. Lydia sees a picture of Jessie’s motorcycle, and almost creams her jeans. Jessie’s other girl, Natalie, is happy with the sweatshirt Jessie got in his HOH pack, as she’ll be wearing that all week. Lydia doesn’t look so happy when Natalie says, “thank you, Big Brother”. Jessie, Casey, and Jordan are now sitting outside, talking about whether Jessie is going to nominate Ronnie. Natalie wanders out, and they continue to talk about Jessie doing the right thing. She plays dumb, saying she “assumes” that he’ll stick to the plan, but Casey stupidly carries on about how Jessie already has a big target on his back. Keeping Ronnie would just add to it. As you may guess, Natalie runs right up to inform Jessie of this conversation. Outside, Casey admits she shouldn’t have said anything. “But he doesn’t say it to my face”, Jessie responds. In the diary room, Natalie brags about what an influence she has on Jessie. Yeah, but so does another female…as we’ve been promised to see later in the episode. After commercials, we get to romance filler. Jessie and Lydia are cuddling on the hammock, and Lydia admits to a “kindergarten crush” on him. She tries to tell him stories, but he keeps interrupting with little comments on his and her appearance. In the diary room, Jessie babbles some nonsense about Lydia being a little butterfly, and that sometimes he too is a little caterpillar. It really makes no sense, like most of what he babbles in the diary room. Lydia and Chima finally wander off to bed, and Natalie then says that she doesn’t think that Lydia likes her. “I think Lydia is jealous of our friendship. I don’t think she likes me, and I don’t trust her.” Jessie clearly doesn’t want to talk about it, and brags in the diary room about all the women wanting him. “It’s tough being me sometimes. In this game, it‘s not always a good thing to be ridiculously good looking.” Ugh. Michelle says she needs to talk to Jessie, and we see her go up to the HOH to chat with him and Natalie. She claims to be a loyal vote to him, and he (rightfully) complains that she only wants to talk to him when he has power. This goes around in circles, and Michelle doesn’t really give Jessie the answers he wants. After commercials, we hear from Jordan about how awful it was to be a “have not”. Yes, it’s the intro for the “have/have not competition. Jessie calls the house together and in the worst southern accent ever describes the rules. This time, only one contestant per clique will be participating. Jordan’s the only “popular” left, and Chima volunteers to play for her team. Jessie says that it’s Kevin’s turn to play, and he agrees. It’s now Jordan’s turn to visit King Jessie and Queen Natalie. Jessie asks how booting Ronnie would benefit her, and she doesn’t really give Jessie any reasons to nominate him. She still believes he’s the target, but hopes she’s not the pawn. 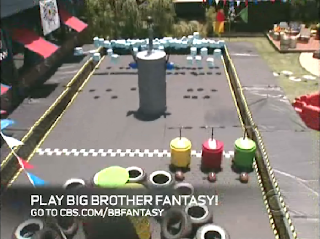 “It’s awful being the pawn.” She runs down and tells Jeff that Jessie isn’t going to go against the house. Oh really? After another set of commercials, we see Russell and Kevin hanging out. Why, I don’t know. They have a nice chat about relationships, but there’s really no reason for this segment. Yeah, they both admire and respect each other. That’s nice. They guys may have harmony, but the ladies don’t. Lydia talks about how Big Brother is like a college dorm, and because of the cliques you’re constantly changing rooms and beds. Natalie, though, has not changed beds yet, and they have a bit of a tiff over this fact. Poor Lydia has never had a bed to herself, while Natalie has the entire time. The producers are right. This show is like high school. Lydia decides to prove a point she’s just going to stay up all night. Kevin tells her it’s just going to make it “so much worse”, and that it could be a disaster. He doesn’t want to give them an excuse to put her up as a pawn. Meanwhile, Natalie is indeed bitching about Lydia to Jessie. I have to agree with his lack of enthusiasm here. She claims that she’s not going to act civil around Lydia any more. Once again, Natalie complains about how Lydia is jealous about the two of them, and that if she‘s HOH she‘s going to put her up.. Yeah, she’s right, but wait until Natalie finds out about their late-night activities! Jessie then runs into Lydia in the bathroom, and invites her upstairs to “talk”. She declines (for once), and walks away. They have some words about Natalie constantly being in the HOH, and Lydia says she only wants to talk to him, not her. Jessie (rightfully) complains in the diary room that both of these women are forgetting that they’re playing a game. Well, it’s that time. 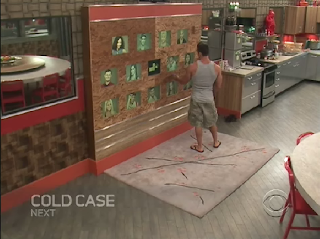 We see Jessie standing in front of the wall of keys, and reading off the speech about the duties of being HOH. Casey and others comment about who should go up, and then the keys are pulled. The first key pulled belongs to Chima, and is followed by Kevin, Casey, Lydia, and…Ronnie! Jordan and Michelle are nominated! Wow. I just watched it. Ronnie is idiot!